In this article we discuss the 10 things you need to know before you climb Mount Kilimanjaro. There is a common misconception that you need to be super fit to be able to climb Mount Kilimanjaro. This is simply not true. In fact many fit people struggle to reach the summit because they exert themselves too much during the early stages of the trek and therefore don’t give themselves enough time to acclimatize during the ascent. Of course having a good level of health and fitness is important for anyone wanting to climb Mount Kilimanjaro, but you don’t need to be an experienced marathon runner! On Kilimanjaro you will be trekking approx. 5-7 hours a day (summit day being a lot longer). Preparing for these treks through practice hikes in your home country is a great way to build up your fitness level. If you don’t have time to do practice hikes our recommendation is to do basic cardiovascular exercises at the gym, such as running and cycling. 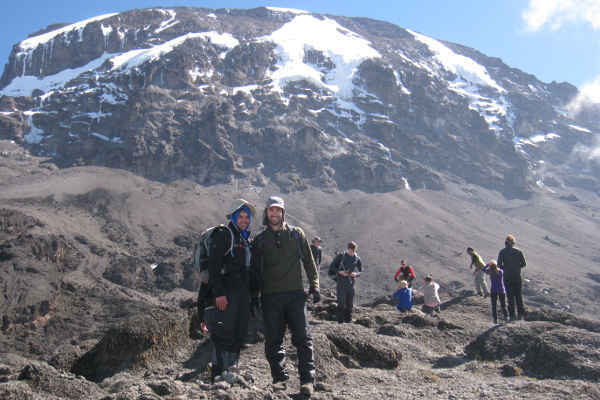 This article gives detailed advice on training to climb Mount Kilimanjaro. To Climb Mount Kilimanjaro does not actually require any climbing skills. In fact, Kilimanjaro is just one big hike. On the Machame, Lemosho, Shira and Umbwe Route there is one section called the Barranco Wall that requires very basic bouldering skills. No preparation is required for this section of the hike though. We cannot stress enough the importance of having the right equipment to climb Mount Kilimanjaro. The hike covers four climatic zones and therefore layering of clothes is key to staying warm and comfortable as you ascend. A base thermal layer, mid fleece layer and outer jacket is a must. The right gloves and hiking boots are also critical. Many hikers use trekking poles which are helpful for balance and take the pressure off your knees, especially when you descend. The list of kit requirements is fairly lengthy. We recommend reading our detailed Kilimanjaro Packing List here. There are seven routes from which one can climb Mount Kilimanjaro. The Machame, Umbwe and Marangu routes approach the summit from the South. The Rongai route which starts from the North East is dryer than the other routes and therefore a little less scenic. Because it is slightly out of the way the route is never overcrowded. Some people start their climb from the East using the Lemosho and Shira route. Both are very scenic and beautiful. The newest route is the Northern Circuit, which is also the longest route. The Northern Circuit provides lots of opportunity to acclimatize and hence success rates are high on this route. Here is a complete overview on Kilimanjaro Routes. No. 6 Kilimanjaro Weather – When to book your climb? There are two rainy seasons on Kilimanjaro – March through to end of May and November through to February. The south is wetter than the northern slopes, making the Rongai route a favourite during the rainy months. Here is an article on the best time to climb Mount Kilimanjaro. Given enough time the body adapts to changes in altitude. Some people experience worse altitude sickness symptoms than others. There is no correlation between susceptibility to altitude sickness and factors of gender, age, fitness ect. To prepare for altitude it is important that you understand the symptoms associated with Acute Mountain Sickness. We highly recommend reading our article on acclimatisation which goes into much more detail on acute mountain sickness and the medications you can take to help prevent the onset of AMS. Dehydration is a key cause of Acute Mountain Sickness. The more fluids you can drink the better. Daily recommended intake is 3 litres of water. You can add an energy supplement to the water to make it taste better and always remember to add purification tablets. You may also decide to take Diamox, which is a medication that helps prevent the onset of AMS. Here is a detailed article on Diamox. Eating well on Kilimanjaro is key to your success – you’ll need the energy on summit night. Food is carried and prepared by your guiding team. Typically breakfast consists of tea / coffee, bread with spreads, porridge, sausage and eggs. Lunch usually includes soup, bread, a cooked stew or sandwiches. Dinner is similar to lunch. Taking adequate snacks is important. Energy bars are a great idea. Plan to eat 3 a day. One of the main symptoms of AMS is nausea and loss of appetite. If you experience these symptoms you must remember to try eat something to ensure that you have some energy reserves you can draw on during the summit. Eating a few biscuits helps! Water is critical on the mountain. On day one you will be given 2-3 litres from your guide. During the climb porters will be collecting water to replenish supplies. You should aim to drink at least 3 litres of water a day. Dehydration is a key cause of AMS so make sure you remain hydrated. You can add an energy supplement to your water to make it more palatable. You must add water purification tablets to your water. The Kilimanjaro guides and porters are your greatest asset on the mountain. Most guides and porters are locals who speak Swahili. Guides usually have a good command of English. Typically every climbing group has at least 1 guide, and each climber has three porters. Porters carry all gear, tents, cooking supplies and water. You will learn to respect these guys by the end of day one on your climb. – each porter carries approx. 20kg of kit on their back!! To find out more about guides and porters including standard tipping rates, check out this article. Getting to the top of Mount Kilimanjaro has a lot to do with determination. There will likely be a point during the summit attempt where you might feel like giving up – typically around Stella Point or Gilman’s Point. You might be feeling awfully sick and exhausted. At that lowest point it is important that you remain determined to get to the top – one step at a time! Of course your determination must not supersede your health. Monitor AMS symptoms closely. Your guide will be monitoring you. It is important that you listen to your body and others in your group if they say that you need to descend. Being prepared is key to success on Kilimanjaro. You can find a complete Kilimanjaro kit list on this page. P.S. If you have any questions feel free to leave a comment below and we will respond within 24 hours. Climb high sleep low is not medically proven and for AMS walk slow is best and rest. Also 3 porters to 1 climber, sorry but that is poor advice and ripping tourists off. U can hike the mountain with a guide only or 1 porter and do your own water collection and put your own tent up. Also fresh food dinners ha ha, no real climber does that. Use dried foods weigh less and easily got rid off. Hi Stuart, thanks for your comment. You make valid points for people who are serious trekkers / mountaineers, who aim to tackle Kili using an alpine mountain style of climbing (or trekking in the case of Kili). We admire this type of climbing and would encourage anyone with the right level of experience to tackle Kili using lightweight and limited support methods. However, I would hazard a guess that this group account for about 2-5% of people who climb Kili every year. The other 95% of trekkers on the mountain (~30,000 people) often have limited trekking experience – for some Kili is their first experience of long-distance hiking and certainly their first experience of high altitude. Many people have in fact never camped before, let alone setup tents and cooked in the backcountry. For this group of people (i.e. the majority of trekkers on the mountain), full support teams are absolutely necessary. Is it 100% necessary to have a guide/porter? If you have a wealth of backpacking experience and even some climbing, must you hire a guide? Are there regulations that require it? Hi Bob, yes, you need to take a registered guide in order to get onto Mount Kilimanjaro. Ps i had no special training and didnt wear any special clothing the only time it got cold was just before the final climb, other than that everything was just one long trek. That’s great news! We’re not in touch with anyone in SA who can help, but you should be able to find loads of useful information on our site. Failing that I recommend Henry Stedman’s book. The good news is that many people in there sixties climb Kilimanjaro successfully every year! I’m a Kilimanjaro mountain guide for 16 years now! Is not a big deal,what you need to do is to stay healthy and little exercise to keep you fit,like jogging and long walks. No technical skills required! On the mountain the pace you required to use is slowly,slowly pace. The fit persons climbs more easy,uses less oxygen per unit of work done and is more energy efficient. Imprve you Cardiovascular (CV) fitness by exercising in your taget zone at least 20 minutes several times a week. Dancing,cycling,swimming,treadmill,or climb small hill to prepare your leg muscles from the rough terrain or climbing lose screen. You will need extra day on the mountain for more acclimatize. Did you do it Jennifer? Are there regulations in place requiring a party to be accompanied by a guide? IF not How necessary is it to have one, especially if you have a wealth of backpacking experience? Hi Bob, Yes, all trekkers on Mount Kilimanjaro need to be accompanied by a registered guide. As most treks are full camping expeditions it is also useful to have a porter or two to help carry gear, food, supplies. All the best! Is it possible to hire a registered guide for an independent hiker rather than go on a tour group? Hi Lisa, it is possible to hire an independent and registered guide, but unless you plan to carry most of the gear yourself you will also need a small support crew of porters. Many tour operators can arrange a private 1-person trek but these can be quite costly as all costs will be borne by you. Group treks are affordable as costs are spread among the group. Hope this helps! Hi Stephen, it really depends on your tour operator. Generally, if someone can’t continue due to altitude sickness, then a guide will assist them off the mountain and the rest of the group will continue. It is therefore important to check with your tour operator that they have a high guide to client ratio. The cheaper operators cut corners here as the more guides and assistant guides, the more expensive the trip. But ultimately you pay for what you get and I would make sure that your tour operator has explicit safety descent procedures and a high guide to client ration. In terms of trekking poles, these are not mandatory. Many people, including myself, find them very useful on the descent. All the best! My concern. I’m climbing Kili in 6 weeks time and have all these questions about the summit night. How do I carry a insulated water bottle, two others bottles with water…a hand torch and still have my hands on my trekking poles. Hi Pat, you shouldn’t bring a handtouch, you need a head torch! Your water bottles can be kept in your daypack / or if you using a hydration bladder this will be sitting in the back of our daypack. Your hands should therefore be free to hold your trekking poles. Hope this helps! Really strange question, what is it best to sleep in clothing wise? Hi Natalie, lower down the mountain you might get away with sleeping in your underwear / thermals. As you get higher up and particularly on summit night you might want to wear most of your clothing that you will be wearing on the summit push. Hope this helps. Hello! I’m currently trying to book a trip to climb Kilimanjaro, and our travel agent is suggesting that we should wait 3-4 days after landing in Tanzania before we start the climb. It’s for my honeymoon, so I was hoping to rest for a day after flying in and start climbing directly after, which would give us 3-4 days at the end of the climb for the safari. How long after you land did you start your climb? Do you have a recommended resting day period for people to follow before they start climbing? Yeah, did course. Contact my partner, Kandoo Adventures! They are amazing! Hi there, I was wondering if there was an age restriction on climbing the mountain? I have a very fit and able 16 year old. Would they be able to climb (with me and my partner) or do you have to be 18? Hi Lucy, the minimum age to climb Kilimanjaro is 12, so your 16 year old child will be able to join you! Hi I just decided to climb Kilimanjaro as couple of my friends are doing so. I am 27 and consider myself fit, as I go to the gym about 3 times as week and dance 2 times a week. But I do not have much hiking experience. I have little bit more than a moth before the trip, do you think that is enough time to prepare for the? And what are the best ways to do so in such short time? Hi Amelia, yes it is common for solo travellers to join an open group. As a solo female I recommend checking out: https://www.ladiestrekking.com/tours/climb-kilimanjaro/. All the best! Do you think a fitness program like Fit For Trips would be a good way to prepare for the trek? Hi Betty, I haven’t heard of Fit For Trips, but just checked out their site and I’m sure their fitness regime would provide good training for Kilimanjaro. All the best! Thank you for putting up a ton of useful info. I’d like to know if there is any itinerary that avoids night time climbing and also bypasses the Barranco Wall. Hi Raju, the Rongai, Marangu and Northern Circuit all avoid the Barranco Wall. Unfortunately most commercial climbs are designed for a early morning summit push (from 12pm). This gives trekkers enough time to ascend to the summit by sun rise and then descend to the lower camp by mid afternoon. Summit day is around 12 hours long so if you started your summit push at around 7am you would get back to camp at night, which would be dangerous. There are ways to attempt the summit during day time but most then camp in Kilimanjaro’s crater. As this camp is really high you need to be well acclimatised to do this route variation. I would speak with your tour operator and see what they can offer. To put your mind at ease though, the summit push at night is generally very good as you will be moving slowly and in single file with each person using a head-torch, so visibility is pretty good. If you can organise you climb to coincide with the full moon and the night sky is clear then, visibility can be great. Hope this helps! 2 questions, I have emphysema, which was thankfully diagnosed in the early stages. So would I be able to take on the Kilimanjaro challenge? Also I’m a Coeliac, so need a gluten free diet!! Would my diet be catered for? Hi Sally, in terms of getting a gluten free diet I recommend chatting with you tour operator. Many are able to cater for various diets. You can also bring gluten free pasta to give to your tour operator’s chef and he can then substitute this for any gluten ingredients. With regards to emphysema, unfortunatley I’m not qualified to answer that question. I recommend contacting your doctor for the go-ahead. All the best! I am female and 73 next Year when I plan to climb to the Kili summit. I am in perfect health except arthritis. Will the cold weather cause arthritic problems? Will the porters carry all the water or do we carry 3 liters? Hi Elfrieda, great to hear that you are looking to climb Kilimanjaro. In terms of your arthritis, if your symptoms currently get bad during cold weather then I suspect the same would be true on Kilimanjaro. It does get very cold higher up the mountain. So extra layers of good quality gear is highly recommended. In terms of keeping your hands warm, I recommend two layers for gloves – inner and outer layers – as well as the use of hand warmers: https://www.climbkilimanjaroguide.com/kilimanjaro-kit-list/kilimanjaro-gloves/. Porters will carry your main gear bag, but generally hikers carry a daypack with water / other essentials. You may find that your guide can help carry some of your daypack load. Hope this helps! Hi, I am going to be climbing Kili most likely around next August. I have been preparing a lot in advance regarding training and creating a list of equipment to bring. Two simple questions: How far in advance do I have to book my trip? I am not sure if it varies with the different companies but on average.. a month, few months? And also do I have to buy my own equipment? I know with some of the seven summits all of the equipment is provided by the company you use, but I did not know if that is the case with Mt. Kilimanjaro. Thank you very much! The guides carrying all that kit, food and water not to mention cooking and setting up camp, quite amazing. So 3 guides per person is about average? I suppose the alternative is carrying most of it yourself,would this work out significantly cheaper if all the group followed suit? 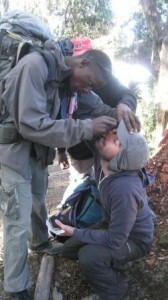 I know you have to have a guide to attempt Kili but is it possible to do this without having everything done for you? Hi David, generally the guides don’t carry much kit, except their own. Most gear is carried by porters. On average there are two porters person, each carrying the trekkers duffel bag (~20kg) and a portion of the camping equipment (tents, chairs, food, cooking gear etc.). It is possible to trek lite, without porters, but most commercial companies do not offer this as an option. Either way you need to take a guide at the minimum. Hope this helps. I was wondering if we have to carry sleeping bags, mattress and clothes by ourselves or will the porter carry this? I’m asking because we are going to travel through Kenya / Tanzania with a backpack (55-75L) full of clothes + other stuff and it will definitely be much harder if we have to carry all this by ourselves. Hi Wim, good news – your porter will carry your main bag. All you need to carry on Kilimanjaro is your daypack. I 63 and want to know if I can bring my own group of friends instead of climbing with some of these macho knuckleheads ? Also, since we can afford the luxury, can we take a few more experienced guides? If you are prone to motion sickness does this affect the chances of AMS? Hi John, without pre-acclimatising I would strongly recommend not trying to hike Kilimanjaro on any route less than 6 days. There is a 5 day route, summit success rates are around 45% on it. The issue is not fitness, it’s altitude. All speed ascents on Kilimanjaro have been done by people who have spent a week acclimatising either on Kilimanjaro or on Mount Meru.